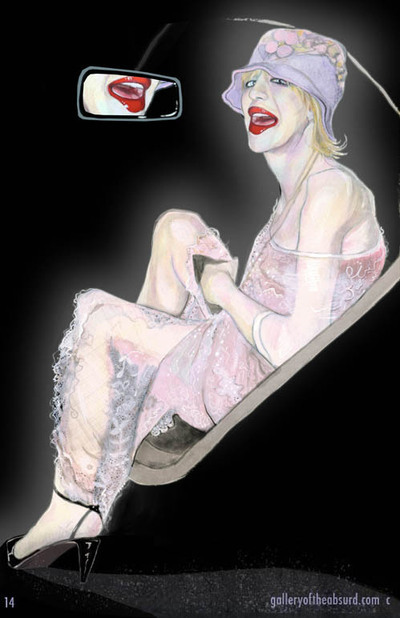 After a series of photos were taken of Courtney Love emerging from a dark limousine, tabloids and bloggers were quick to point out her ghostly appearance. The always upbeat Daily Mail claimed frightened onlookers "drew gasps" over her ghoulish "deathly pale skin" and painfully thin frame. Commentary across the gossip blogs were nearly unanimous in deriding Courtney for her "bride of Frankenstein" pallor and "crack addict" body. While the photographs do indeed suggest that Courtney might do well to put a little meat on her bones, I found them to be stunningly gorgeous. Courtney's alabaster skin appears to glow against the inky darkness that surrounds her almost as though she's her own light source. The ragged, see-thru lace gown suggests an elegant faded glory even though it looks like something yanked down off grandma's curtain rod. 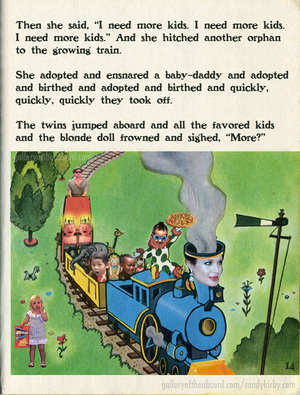 The eye can't help to be drawn to the saturated crimson red of her cartoon lips as they provide the only spot of color in the photograph. Bravo to the photographer who captured the essence of Courtney Love's erratic personality. I know many won't agree with me here, but I'd much rather see a real and slightly crazy human being in a see-thru dress than a bunch of vapid wooden-posed air-heads with see-thru personalities. Medium: Gouache, acrylic, iridescent glitter on paper with a touch of photoshop. Painted as a gift for my friend Chrissa. I love muscle cars from the 60's. I love high-speed car chase scenes. I love Steve McQueen. Therefore, I love the movie Bullitt. 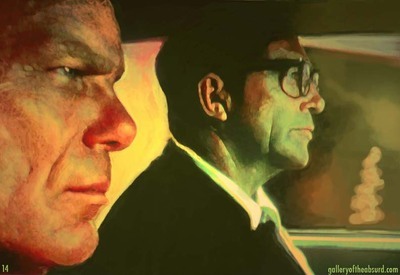 I took a black and white photo off the idiot box while watching the Bullitt car chase scene for the 100th time and then downloaded it and painted over the top just for kicks. I also used this image for a post while guest blogging over at The Film Experience blog. Hollywood is filled with wealthy old coots who still manage to lure lovely young women to their bedrooms, but none come close to the effortless endearing cool embodied by Jack Nicholson, Geriatric Gigolo. 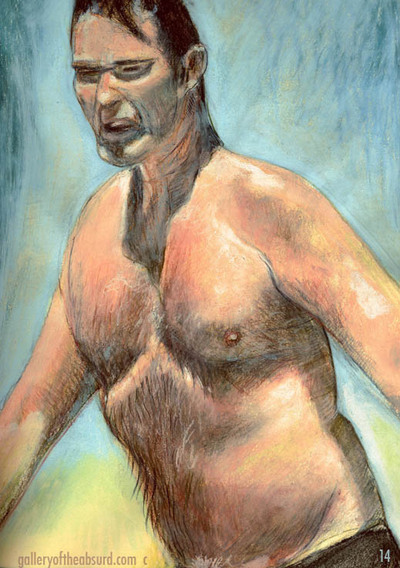 Most Hollywood studs of advanced age attempt to maintain their youth by going under the knife, recieving hair transplants and maintaining their waistlines with heart-healthy diets low in carbs, high in fiber...but not Jack. He lives life by his own standards and gives not a care what anyone thinks about it. 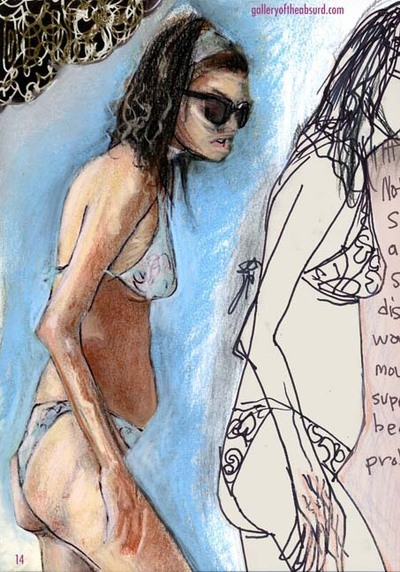 On any given day, he might choose to wear swim trunks and let his quivering pendulous belly flap in the breeze as he chows down on a huge submarine sandwich while knocking back beer and cigarettes as doting young females throw themselves at him. Keep an eye on Jack this summer. You'll see plenty of paparazzi photos of him on yachts, eating steaks, drinking wine and whispering cigarette smoke-infused sweet nothings into the tender young ears of giggling bikini-clad women eager to follow him back to his bedroom. Medium: graphite drawing, digital color. Much thanks to Lynn for the alliteration. 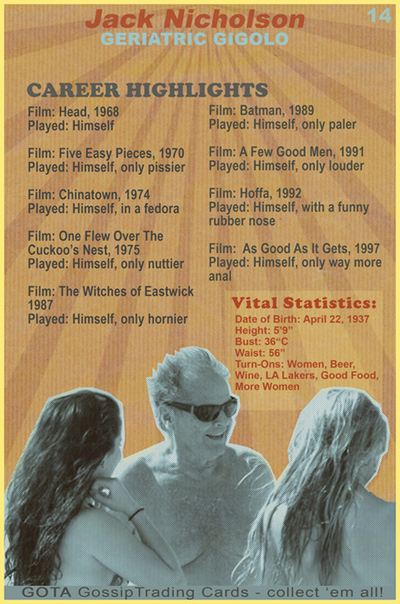 The back of Jack's Gossip Trading Card contains fascinating information regarding career highlights and vital statistics written by film geek enthusiast, Viper Tetsu.